Those bits of sea glass ground smooth by the ocean before being scattered on the beach (sometimes known as mermaids' tears) can touch the imagination in special ways. Every now and then, walking on the beach, my wife stops, reaches down, plucks a piece of smooth glass out of the sand, and puts it in her mouth. She calls it salt glass for the tang that it leaves on her tongue. Others call it sea glass, or beach glass, or even mermaids’ tears, shed for lost sailors. 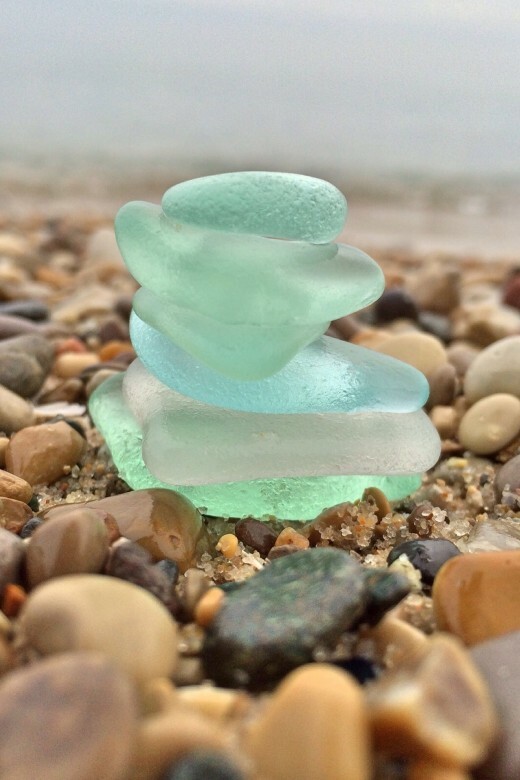 Sea glass comes in a narrow, subtle spectrum of colors. The primaries are beer-bottle-brown, Coke-bottle-aqua, and wine-bottle-green, but each piece varies slightly in hue. The buffing of the sand softens and clouds the colors, turning what was transparent into translucent. Clear glass is frosted to a milky white. It suffers a sea-change into something rich and strange. If you’re lucky, you may find brilliant bits of Milk-of-Magnesia blue. Rarer still are yellow and red. Where do they come from? The stained-glass windows of sunken millionaires’ yachts? The taillights of gangland-victims’ cars? Rubies from the turbans of drowned maharajahs? Sea glass is pretty to look at, jumbled together in a glass bowl on the coffee table. You can hold it up to the light and look at the sky through the foggy lens of the ocean. It feels good in your pockets, like worry beads. For my wife, who spent her summers on this shore, the taste of salt glass gives her back a bit of her childhood. I never liked the beach much as a child; I preferred the cool dark interiors of our rented apartments and a good book. But now I like to walk the beach with my children, our heads down, intent, snatching at every glittering shard. They cheat. “Here’s some!” they shout, holding up a chunk of quartz, a splinter of driftwood, or the fool’s gold of a jingle shell. Then, just as the inner glow of the glass grows dull the longer it is out of the water, the attraction of the hunt fades. They wander off, splashing in the shallows, as hard to hold as a handful of sand. A sea glass expedition used to be good for at least half an hour, but as the kids grow older, they are losing interest in the treasures at their feet. They have started to lift their heads to the horizon. The fact that this is inevitable doesn’t make it any easier. First they learn to swim, then to sail. Before you know it, they are hull-down, bound for Rio and Cape Horn. It hasn’t happened yet, but I know it will, as surely as the waves grind the edges of broken bottles smooth and spit them up on the shore. More often than not these days, I walk the beach alone, looking for the sparkle in the sand. Hands in pockets, I rattle my beads. Every now and then I put one in my mouth and taste the bitter tears of mermaids.